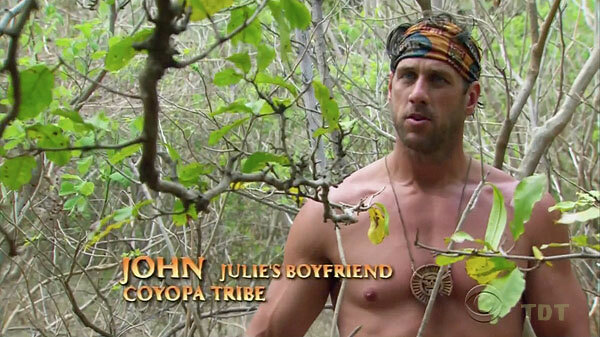 Survivor: San Juan del Sur (2014) - 16th place, 3rd out. Voted out in Episode 3, "Actions vs. Accusations" (Day 6). Cumulative time: In-game - 5.5 days; Exile Island - 1 day. San Juan del Sur Ep. 1 IC: "Temple of Syrinx" - Gives Coyopa a lead by solo-hoisting Baylor for bag retrieval, landing the climbing rope, and helping people climb the last wall, but Coyopa loses. San Juan del Sur Ep. 2 IC: "Sumo at Sea" - Loses in his bout against Jon, and Coyopa loses again, 5-4. San Juan del Sur Ep. 3 IC: "Game of Throw-Ins" - Paired with Jaclyn, sinks a shot vs. Drew/Reed, but Coyopa loses again, 3-2. San Juan del Sur Ep. 2 RC: "Parallel Universe" - Loses to Julie, gets exiled (with Jeremy). San Juan del Sur Ep. 2: After seeing Jeremy's Exile Island clue, follows the directions to dig at Coyopa camp, and in short order, finds Coyopa's "hidden" idol. San Juan del Sur Ep. 3: Refuses to catch on to various clues, gets voted out with the idol in his pocket. San Juan del Sur Ep. 1: Nadiya Anderson (voted out, 5-3-1). San Juan del Sur Ep. 3: Five votes, from Alec, Baylor, Jaclyn, Josh, and Wes (voted out, 5-2). Val! Why didn't you play your idol?! Ep3: Jeremy's going to be mad that I voted Val out, but come on! I told her to play her idol! I did all I could! I did all I could! It was my alliance's fault! Jubilation! Coyopa (ok, Wes) finally wins! Stay the course, keep the tribe strong, etc. Gordon Holmes at XfinityTV.com (10/9/14): "John Rocker - 'I Chose to Look Like an [Expletive]'"
Dalton Ross at EW.com (10/9/14): "John Rocker talks about that big Survivor blow-up"
Rob Cesternino at RHAP (10/9/14): "Exit Interview with the Latest Player Voted Off San Juan del Sur - 10/09/14"
Inspiration in Life: My father. The majority of the values, ethics and moral that have made me who I am and shape me to this today. I learned from watching how he conducted himself. My father passed in 2007 and I still find myself wanting that ability to ask his advice on certain things because his direction was so important to me for many years. Hobbies: Hunting, fishing and golfing. Pet Peeves: Rude, lazy, selfish people and traffic. 3 Words to Describe You: Intense, self-motivating and responsible. Survivor Contestant You Are Most Like: Jeff Kent because we have a similar background as an MLB player. We have a strong understanding of teamwork but are also very driven to attain individual success though Jeff is a bit more subdued than I am. Reason for Being on Survivor: To have an extremely unique life experience and to immerse myself in high level competition and like I’ve done my entire life, figure out a way to be the best. 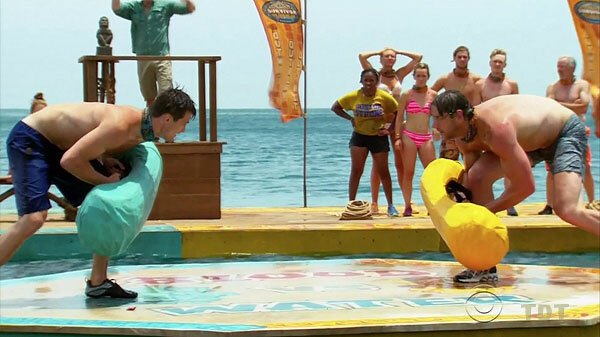 Why You Think You’ll “Survive” Survivor: I have world class athletic abilities and leadership skills. I have the ability to read people and morph my personality in a way that lets me mesh with people from all walks of life. Why You Think You Will Be the Sole Survivor: A relatively significant part of Survivor depends on athletic ability and I spent more than a decade of my life physically competing at the highest level. I still retain much of that physical ability as well as the mental toughness that is required. I also possess a high quality of outdoor survival skills which will be valuable to those around me as well as leadership skills and the ability to influence people and easily make friends. What Does It Mean to You to Play Survivor with Your Loved One? To me, playing Survivor with my loved one means having the opportunity to engage in a very unique experience together. Life is about creating new experiences which many times can bind individuals together on a more intimate level. I am hoping that Survivor will do this for Julie and me."